Network, Annikki Luukela's lighting installation at the Kaisaniemi metro station, begins behind a wall of glass on the upper level of the station and continues along the walls of the escalators down to the platform level. 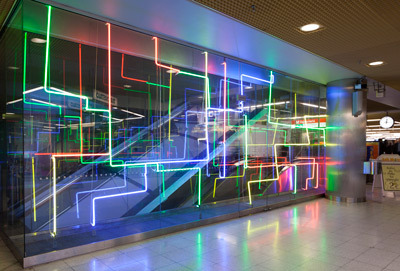 The installation also includes neon and hologram works designed by Luukela, displayed in glass cases on the platform level. The subject of the work behind glass on the other side of the platform are the architect Engel and the neo-classical centre of the city designed by him. The work contains a over 100 metres of coloured neon lights. Some of the neon tubes are laminated with a milky film that softens the light. The Kaisaniemi metro station was opened in 1995. The work belongs to the collections of the Helsinki Art Museum.